The process of engineering analysis, especially its preprocessing stage, comprises some knowledge-based tasks which influence the quality of the results greatly, require considerable level of expertise from an engineer; the support for these tasks by the contemporary CAE systems is limited. Analysis of the knowledge and reasoning involved in solving these tasks shows that the appropriate support for them by an automated system can be implemented using case-based reasoning (CBR) technology. 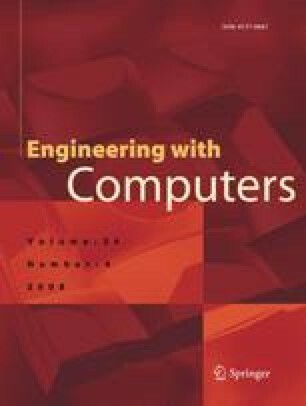 In this paper the automated knowledge-based system for intelligent support of the preprocessing stage of engineering analysis in the contact mechanics domain is presented which employs the CBR mechanism. The case representation model is proposed which is centered on the structured qualitative model of a technical object. The model is formally represented by the Ontology Web Language Description Logics (OWL DL) ontology. Case retrieval and adaptation algorithms for this model are described which according to the initial tests perform better in the chosen domain then the known prototypes. The automated system is described and a sample problem-solving scenario from the contact mechanics domain is presented. Use of such system can potentially lower costs of engineering analysis by reducing the number of inappropriate decisions and analysis iterations and facilitate knowledge transfer from research into industry. The work is financially supported by the ‘Mikhail Lomonosow’ grants of DAAD and Ministry of Education and Science of Russia. The authors would like to thank Alexander Kapysh and Anton Kultsov, Master students of Volgograd State Technical University, for participation in development of ISFEA.